Luxe oils and a beautifully curated cosmetic line exemplify the minimalist perfection of the woman behind the brand. In a new series, VIOLET GREY profiles female beauty entrepreneurs who are considered industry game changers for their individual approach to business. Each one entered the conversation in her own manner and maintained a steady, if not unparalleled, trajectory with her indomitable spirit. Here, we talk to Linda Rodin. 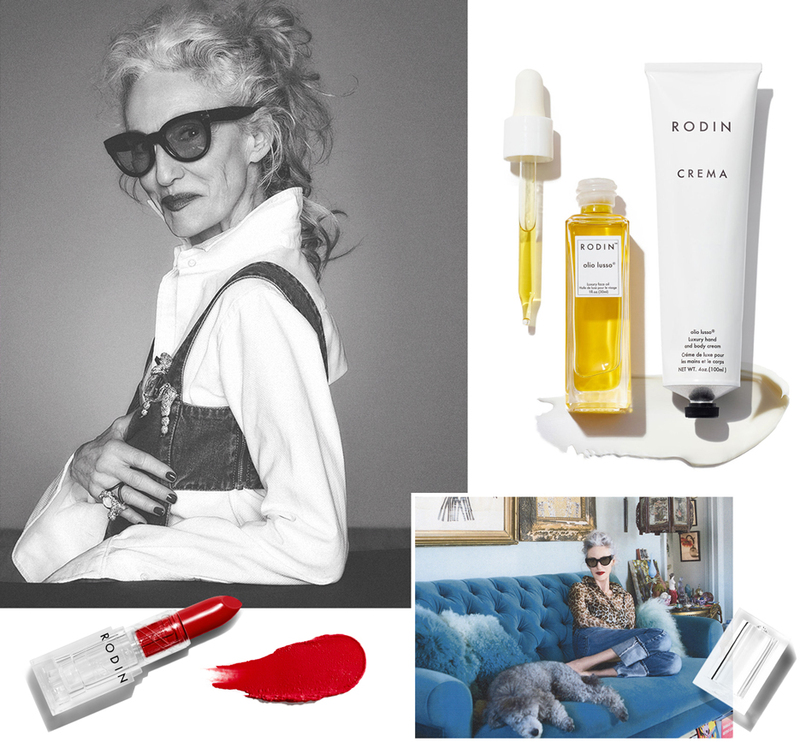 In the world of cult beauty products, few are cultier than Rodin Olio Lusso Face Oil, created by Linda Rodin in her New York City kitchen in 2006. A delicious-smelling blend of 11 essential oils, including jasmine and neroli, Olio Lusso can be found in the vanities of celebrities, fashion icons, royalty, and anyone who knows beauty enough to know about Rodin. Its sleek glass bottle and spare white label are the epitome of chic, much like the creator herself. Rodin, a former model turned fashion editor turned in-demand stylist, was already worshipped in style circles for her easy elegance—all upswept snowy hair, perfectly colored lip (often red or berry), and impeccable denim. Her path to beauty entrepreneur came when she noticed a hole in the market for simple, easy-to-use skincare. She spent a year developing her facial blend, using the oils she had come to know and love over time. “I discovered argan oil in Morocco and evening primrose when I was young and had rashes,” she says, referring to two ingredients in the magic golden elixir. “I never made the oil with the idea of selling it or creating a business; the aha moment was the fact that friends and people I worked with, as a stylist, couldn’t get enough.” Their overwhelming enthusiasm meant that Rodin was working in her apartment to meet the demand, crafting 500 bottles (three at a time) one weekend in 2007. My bedroom is my sanctuary. For me it is like being at the seaside. White floors. Pale, pale aqua walls. Cabinets of seashells I’ve collected. And about 50 thriving plants. My bed is quite elevated. I’ve always been “The Princess and the Pea.” I have a white linen spread from John Derian. The top is taut, and the skirt is ruched and cascades forever. On the wall above my bed is an oil portrait of my mother from 1940. It is exquisite, and she watches over me. I wake up between 8:30 and 9:00 a.m., although I’d like to sleep until noon. Yes. My nightstand has my Rodin Crema and Lip Balm. Nighttime essentials for me. I wake up and take Winky (my poodle) out for a morning walk and get my cappuccino at a wonderful local bakery on the way. I never work out. I am not one who exercises. It’s never agreed with me. I rinse my face with warm water. Pat it semidry. Then I apply my Rodin Olio Lusso face oil. That’s it. My Olio Lusso face oil. Sunscreen (unfortunately a must), and then my lip pencil and lipstick. Easy. I always wear my hair up, so that takes five minutes. My emails and the New York Times. Just walking the dog and getting my cappuccino. I need an hour to wake up before focusing on work. I get to the office around 10 a.m. and begin my workday then.